This post is sponsored by my great friends at Borden® Cheese, but the thoughts and opinions here are all my own – just as always. Thanks for supporting the brands that support me. When game day arrives, we might not all be pulling for the same team, but the one thing that we can agree on is food! And even if you’re sitting around watching the Big Game just for the commercials, you’re still gonna need a snack, right? That’s where my Cheesy Chicken, Bacon, Ranch Dip comes into play. 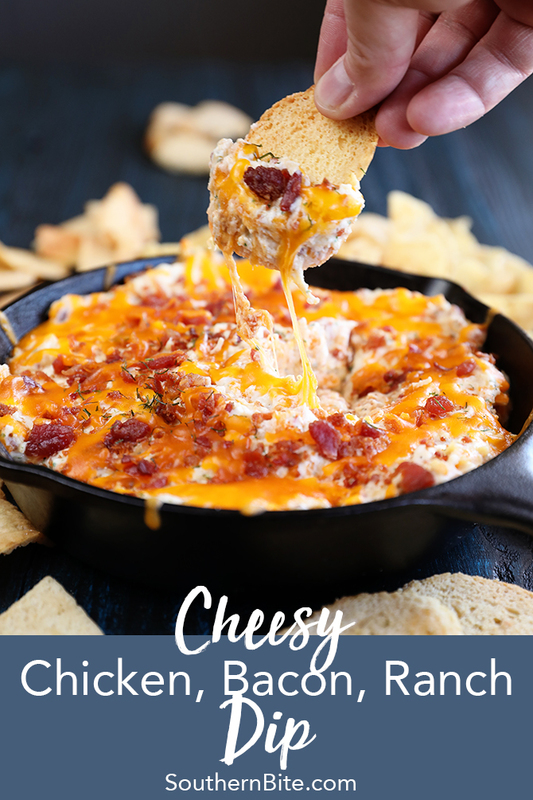 It’s a warm, savory dip that’s a delicious take on my Ranch Chicken Cheeseball that everyone just loves. 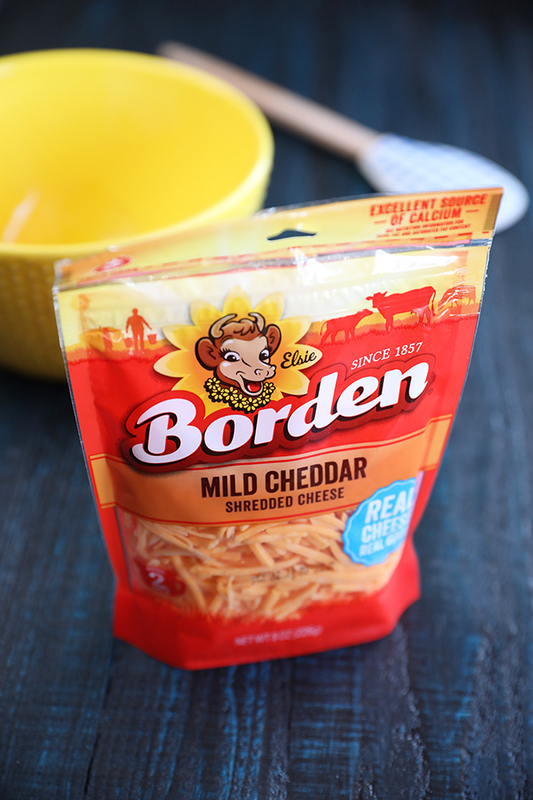 But let’s not forget the real MVP – Borden® Cheese! 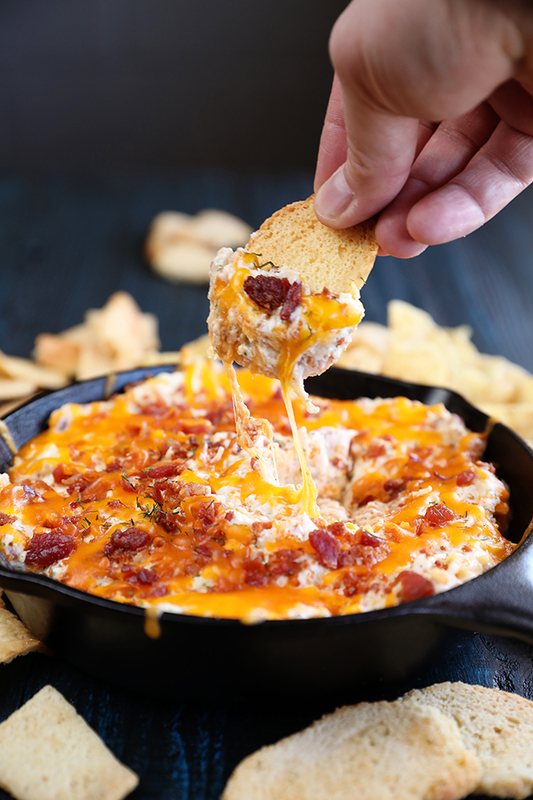 Every chunk, slice and shred of Borden® Cheese is pure, creamy goodness that transforms your favorite game day recipes into something memorable. And it’s my favorite cheese to use because Borden® Cheese is made up of a cooperative of more than 8,000 family-owned dairy farms across the United States. 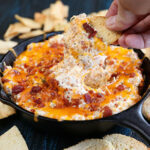 In this dip, it provides the perfect cheesy, creamy element to accent the sharp ranch flavor. When I say you guys are gonna love this, I really mean it! And let’s talk about how seriously easy this is. It’s one of those dump and stir recipes that everyone loves. Mix it all together, pour it into a skillet or baking dish, and top it with a little more bacon and cheese and it’s good to go right in the oven. Gooey, cheesy deliciousness is only about 20 minutes away. For even more cheesy goodness, I love to use Borden® Cheese Thick Cut Shreds. I like to serve this dip with some thick, sturdy chips like pita or bagel chips, but you can also offer it up with some thick corn chips or even veggies – you know… if you’re dieting or something. Y’all enjoy! Preheat the oven to 325°F and lightly grease a 9 to 10-inch oven-safe skillet (or a 1 quart baking dish). Reserve about 1/4 cup cheese and 2 tablespoons bacon and set aside. Combine the cream cheese, salad dressing mix, and drained chicken with the remaining cheese and bacon. Mix well. Pour the mixture into the prepared skillet and sprinkle the top with the reserved cheese and bacon. Bake uncovered for about 20 minutes or until the cheese has melted and the dip has heated through. Serve warm with pita chips, bagel chips, veggies, etc. This sounds fabulous! All my favorite flavors in one tasty dish. Thanks for sharing! OHHH, I know I’m making this for the Super Bowl game! Thank you for sharing this recipe. Sure hope you’ll enjoy it!! 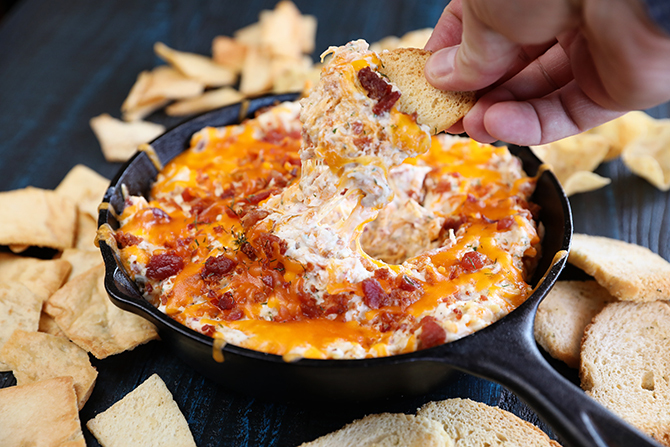 Every gathering requires a good hot cheesy dip! This one is going on my menu asap, thanks Stacey! Right?!?! Sure hope y’all will enjoy this one!